Learning how to fly a drone is scary. First of all drones are scary. They have a bad habit of falling out of the sky and into the stands of very important tennis matches. But flying in general is scary because, well, most people have never done it. Yuneec makes it magically easy and safe. Buoyed by a $60 million investment from Intel, Yuneec has quickly become the company to watch in the consumer drone industry. Lately, a lot of people are saying that this powerhouse is the company that could know DJI, its insanely popular and well reviewed competitor, off its throne. After spending a few weeks with Yuneec’s new flagship device, I can confirm: This is a Phantom killer if I’ve ever flown one. Broadly speaking, Yuneec’s new 4K quadcopter is a pricey entry point for someone who wants to get into the aerial photography hobby. But more specifically, it’s a fantastic value for anyone that wants a top notch flying robot with not only the most futuristic features but also a refreshingly forgiving learning curve when it comes to flying. As the name implies, the Yuneec Typhoon Q500 4K comes with a stabilized 4K video camera, as well as a badass ground control system. (The camera also does 1080p 120fps slow-motion and captures 12-megapixel still shots.) The system comes with a handy Steadygrip camera, a pistol-grip device that lets you use the drone’s camera on the ground using your smartphone as a viewfinder. The base package retails for $1,200, while a more premium kit—including an aluminum case and extra battery—goes for $1,300. More on these details in a second. Yuneec is the Chinese aircraft manufacturer that’s giving DJI a run for its money. While the Typhoon Q500 line of quadcopters is relatively new on the scene, Yuneec has been quietly building drones for American companies like Horizon Hobbies for a while now. The Blade Chroma camera drone—that’s it on the left—is one model that’s comparable to the Typhoon Q500. It comes with the same camera and uses a Yuneec-branded ground station. The Chroma is a little bit cheaper but also smaller. Thanks to a ground control station that works with all Yuneec drones, it’s easy to switch between models. DJI has a hell of a foothold on the consumer drone industry, and it needs a worthy challenger. Yuneec is that challenger, one that’s been around longer than most people realize. And honestly, I can’t believe how much I liked flying its drone. Simplistic as it may sound, the Typhoon pretty much looks like what you’d expect a drone to look like. Unlike its sort of cutesy competitor, the curvy white Phantom series, the entire Typhoon line features mean-looking, angular geometry you’re probably more used to seeing on higher end drones. It’s clearly designed for easy portability, though. The legs and camera snap off without the need for tools, so you can break it down quickly. The Typhoon design is noticeably larger than that DJI Phantom series. I didn’t experience any problems owing to its size, but presumably, that could hurt the drone’s in-air versatility. Like the Phantom, the Typhoon family comes in a number of configurations, the Q500 4K being the most advanced. The Typhoon Q500 4K comes with the best camera, while the Typhoon Q500 and Q500+ come with 1080p HD cameras. The Typhoon G comes with a GoPro mount. However, if you can fly one of them, you can fly all of them since the rest of the hardware is virtually identical. The real treat is the intuitive ST10+ ground station. This device comes works with all Yuneec drones, and it’s amazing. Half old-fashioned joysticks, half new-fangled touchscreen-ready, Android-powered computer, the ST10+ not only lets your fly your drone; it also lets you control the camera and see what the camera is seeing. There are shutter buttons for both stills and video, as well as levers on the side to control the drone’s maximum flight speed and the camera pitch. Meanwhile, The touchscreen is essentially a tablet integrated into the controller, and it’s awesome. This is where the real fun begins. It’s also the point where I need to confess that I have not yet flown the DJI Phantom 3, the new flagship of the Chinese giant’s fleet of consumer drones. 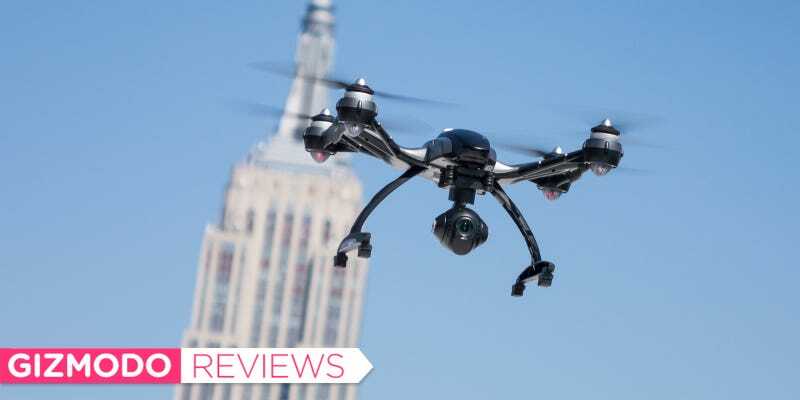 (Gizmodo’s Brent Rose reviewed that drone, and he loved it.) However, I learned to fly drones with the DJI Phantom 2 Vision and Vision+, so I’m well familiar with the excellent hardware. The first thing you’ll notice when you unpack the Yuneec Q500 4K is how effortlessly the whole kit lives up to its fly-it-out-of-the-box marketing. Having only read the specs sheet, I went to my preferred safe drone-testing spot in Brooklyn, fired up the rotors, and was flying in about two minutes. There was no finicky pairing process or app to install on my phone. I just turned everything on and it worked, consistently. I felt like an expert during my first flight, in part because the Q500 defaults to a so-called “Smart Mode” that lets you fly it as you see it. In other words, if you want the drone to to go up, you push the left hand joystick to throttle up, and the drone goes up. Pushing right or left makes the drone go left or right. Everything you do is relative to where you’re standing, so you don’t actually need to worry too much about where the front and back of the drone are. Smart mode is also the mode that enables the Q500’s Follow Me and Watch Me features. Both are killer aerial photography drone features that I’ve lusted after for years, but I’ve never really found a drone that did them well. Follow Me will literally make the drone follow you and the ST10+ wherever you go. (The ground station is equipped with GPS to keep track.) Watch Me makes sure you and the ST10+ are in the camera frame and in focus. The ST10+ ground station is impressive not only for its straightforward controls but also the 5.8GHz and 2.4GHz antennae that keep everything connected. Unlike the DJI set up which requires a separate phone or tablet and sometimes finicky connectivity, I found the ST10+ to be a brilliantly dependable all-in-one cockpit. The Q500 makes it look easy. (Regardless, I recommend you fly in a big empty space, because drone accidents happen.) Again, the first time I took the Q500 out of the box for a flight test, I was up and maneuvering in no time. When I switched on Follow Me mode and ran across the asphalt court where I was flying, the drone followed me. It does not come with object detection, though, so if a tree branch crosses its path, the Q500 will crash. Ditto with Watch Me mode. It’s worth highlighting here—especially if you’ve flown a Phantom—that the Q500 is kind of husky. I’m not sure if it was because of the size or the software, but there tended to be a bit of a lag whenever I tried to take sharp corners or make quick course corrections. This is much more noticeable when you’re going turtle speed. (The speed lever sways between turtle and rabbit.) It still felt a little sluggish at turtle speed. This is not to say that the Q500 can’t go fast. This flying rabbit will sprint if you let it. I do think that the bulky body of the Q500 drone has its pros and cons. It’s fast but it’s not as nimble as smaller drones, like the Yuneec-powered Blade drone from Horizon Hobby. I also tested a Blade—which uses a similar Yuneec-branded ground control system—against the Q500 and found that the smaller drone’s handling was simply sharper. That said, the camera wasn’t as good, but that’s simply because it was the regular HD version, not the 4K camera. The image quality of Yuneec’s 4K camera is very good. (With 12.4-megapixels it also does full 1080p HD in slow motion.) The CGO3 gimbal is smooth, if not a teensy bit slow. Based on reading other reviews, I’ve gathered that the Phantom 3 set up is slightly more advanced, but I can’t say for sure until I’ve tried it. I can say that I was thrilled with the stills and video I shot from my Q500. The bonus CGO Steadygrip is also a blast. It was capable of keeping a smooth shot when I ran around the office chasing coworkers, though I’m not sure how well it would fare on rough terrain. The device itself also feels a little bit cheap and requires eight rechargeable AA batteries. This felt especially annoying since you can charge everything else in the kit by plugging it into the wall. I honestly loved how easy it was to get familiar with the Q500. The fact that you can also buy a full kit with an aluminum case and extra batteries makes it seem like the best all-you-really-need drone package out there. It’s not only easy to fly thanks to Smart mode, but the versatility frankly made super fun to fly. Finally, the battery life (at least 20 minutes) is slightly but also noticeably better than competitors which—especially thanks to the extra battery—longer outings with more pilot-powered fun. I even liked how the ground station started buzzing when I was running low on juice. The Q500 is altogether a great user experience. I missed the jerky little DJI Phantom at times. While I appreciated the flexible range of speeds offered by Yuneec’s ST10+ ground control, I wanted the handling to be a little bit sharper at times. This feeling was emboldened by my test of the Blade drone, a device that depended on Yuneec’s user-friendly set up but also featured a more Phantom-like design. (And honestly, you might not jive with the mean grey-black look of the Q500 4K drone.) The difference in handling is hardly a deal breaker, but it’s definitely worth considering. Are you just starting to become a serious drone pilot, one that’s willing to shell out more than a G for a very versatile craft? Then, yes, you should buy it. I’ve flown a lot of drones, but I’ve seldom felt so confident and safe behind the controls as I did with Yuneec’s Q500 4K. Are you a DJI junkie who just loves those little white zip-machines? I’d give the Q500 a try and see if you like it. The Yuneec experience is, well, unique. The Q500 is not necessarily better than the Phantom, but it’s certainly different. I, for one, prefer it. You, for sure, should take it for a test flight.